Congrats for the 2nd anniversary of your blog!! lovin the vest and the bag. love that dress paired with the vest, perfect for fall! ok, seriously, I wore this outfit yesterday! lol It will be on the blog on Friday, but mine was a blue and white stripe long sleeve sweater dress, trench vest, and just fab shoes! lol Great minds think alike! This just makes me want to walk the streets of Paris... I love the stripes, chic heels, and fun casual vest. Love it so much. CONGRATS on your blogoversary! And I LOVE this outfit - the accessories are sweet! Gorgeous outfit, I adore your vest. Happy two year blogaversary! Happy Blogiversay! Love your blog so much! Happy blogoversary- I missed mine b/c I was still on hiatus. And I totally want your bag! happy 2 year! that's so exciting. everytime you wear that vest i'm so jealous. it looks fab with those stripes. and the purse is amazing!!! this is gorgeous! love stripes! i have a new post up about a shoot i styled, would love to know what you think! Hi doll! Thanks for swinging by my blog and leaving a comment- I love meeting fellow bloggers! I love this outfit- stripes are a serious obsession of mine, and I love a great utility vest. I'm a huge stripes fan, this is so chic! I love your bag too! You look darling in those stripes. Cute outfit and I still love that handbag. Great look. Love the combination! aww happy blog birthday hon!!! i love this the stripes and the anorak vest super chic! I love the vest!!! I want one like that! It takes a lot for a blog to make it even a year. Randomly stumbled upon your site. Love how you match your stripes dress and cover up. Balance. And now, I need to find a striped dress like yours. Love the potential and versatility of black and white stripes! back to the outfit, stripe and vest is the best combo. love it!!! 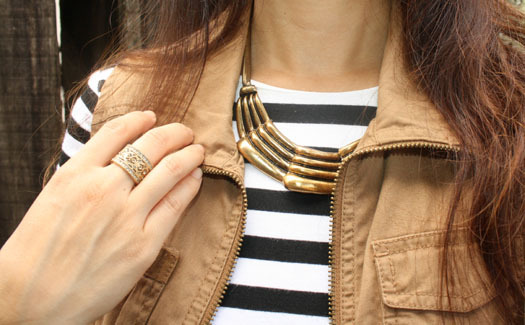 Pairing striped dress and this parka vest was brilliant idea! Lovely! I love that handbag, the colour is gorgeous! xo Have a lovely weekend. Aw! Happy blogoversary Rebecca!!! How exciting and what better way to celebrate than with this super cute casual look! Love the stripes with the vest!